When it comes to online safety, seven-year-old Natalie Ody is already security-savvy. She can talk about wifi, describe a cyber attack and even resist interrogation from a Jisc security expert. 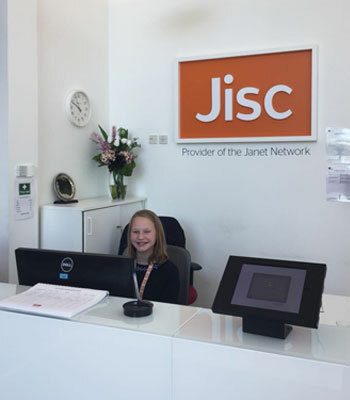 Meanwhile, ten-year-old Eva Banks now knows how Jisc protects the network and its members from harm. We think it’s essential that young people are well educated on using technology, including the internet, and that they know how to protect themselves online. Early interest in all things digital will also help the UK to produce a workforce with the technical skills to support the future economy. 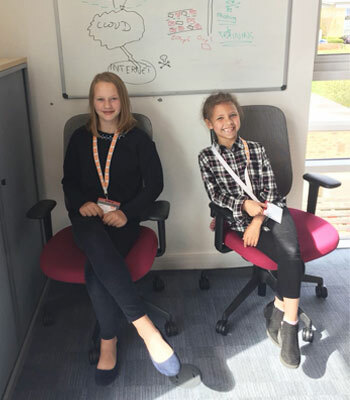 That’s why we invited Natalie and Eva to visit our Lumen House office on April 26 as part of Take Your Daughters And Sons To Work Day, which proved a fun and insightful day for both parents and children and is part of our commitment to the Tech Talent Charter, which aims to drive diversity and address the gender imbalance in technology roles. 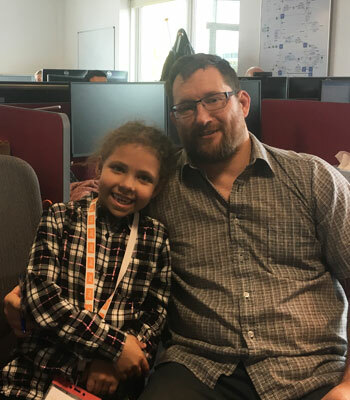 “We’ve always had a joke at home that, if anyone gives the children any trouble, they’re to say that their dad works in security, but I don’t think Natalie had any real idea of what I do before she came to work with me. “She had a long day, but she loved it. Everyone was fantastic and really positive about her visit. She was a little bit shy at first, but I think it was a real boost for her self-confidence and I’m really proud of her. “At Jisc, people have massive computers and most people have mobile phones for work. I also really like the spinning chairs. “People in cyber security defend other people. Jamie and Ant showed me their big TV, which had a map on it with bad things that happen. “I spoke to the security analysts called Ben and Alex, but I’m not allowed to tell you what they do. “Then I spoke to Tim and learned about DDoS cyber attacks. Tim gave me some print-outs to explain it. Stefan, Charlotte and Jason told me I am good at explaining DDoS. “Later I went to Charlotte’s desk and I drew a picture of my house and I told her what I think keeps my house safe and we played a game where she tried to get information out of me, but I didn’t tell her anything. “The computer in front of my dad is connected to his laptop. I saw how many emails my dad has – he has 7,492! “Dad took me around the office to meet people. There was finance, procurement, training and the helpdesk. Ben from the helpdesk explained to me how the big map they have works. The red bits are broken and green bits are working. Some bits changed from red to green when we were talking. “Becky from training was working from home so I spoke to her on Skype. She told me that dad and other people train people and then she marks how dad does. “Jisc has to keep people using the Janet Network safe. They do this by putting barriers around the network to keep internet viruses out. They tell institutions how to lock their buildings and windows and then send someone round to try and break in. They tell the institutions if they need new windows, or doors or perhaps a new set of keys. “Next, I chatted to IT specialist Jamie, who showed me the server room. It is “like a control centre, full of cables and routers. The cables connect everything up to the computer screens for everyone to use. Jamie’s job involves helping staff with the internal network and he is busy a lot. Can degree apprenticeships plug the tech skills gap?